Today’s recipe for Classic Banana Muffins is another recipe that I have made for many years—both before and after going gluten free (with adjustments to create the latter version, Classic Gluten-Free Banana Muffins, of course—more in a minute). It’s a recipe that uses more bananas and less sugar than other banana muffin recipes and I really like that. Before I tell you more about the recipe I just want to say that I can’t begin to tell you all how happy I am to be back baking again! Baking has always been one of my very favorite things to do. It sounds corny, but baking has truly always made my heart sing. I remember having to take a “mental health day” years ago when I was a teacher and notifying my immediate supervisor, the assistant principal (who also happened to be a good friend). Although a teacher needing a mental health day is not unusual, one of the things that I mentioned as evidence that I needed the time off was that I had not been baking at all. My supervisor wasn’t much of a baker herself, but I was a dedicated employee and she knew that I was speaking from the heart so she encouraged me to take the day off and feel better. I stayed home the next day and I donned my very favorite apron (passed on to me by my grandmother) and I baked all day. At the end of the day, I felt completely rejuvenated. I happily returned to school the next day—eager to see my students and with lots of baked goods to share with my supervisor and my co-workers. That day took place long before I went gluten free in 2003, so you can imagine how sad I was when I initially went gluten free and gave up baking for about a year. Almost nothing I tasted that was gluten free and ready made tasted good and, initially, I couldn’t figure out how to change that even when I made gluten-free baked goods myself. Plus, I was in healing mode at the time. Even gluten-free baked goods were better left off the table. So I simply stopped baking for a good while. Eventually I did figure out my gfe approach and excellent baked goods were back on the table. Still, even today it’s difficult for me to get my baking “needs” met during the summer as I don’t want to add any heat to the house by baking and most of the time, baked goods don’t even appeal to me when it’s so hot and humid. But now I’m baking almost every day again and it is wonderful! We’re enjoying the goodness ourselves as well as enjoying sharing the treats with family and friends. These Classic Banana Muffins really hit the spot the other day. Well, they kept hitting the spot to be honest. (Hehe.) Mr. GFE said that he shared one of the muffins I’d packed in his lunch with a friend at work and he was immediately elevated to “new best friend” status! Converting the original recipe to a gluten-free version simply required substituting my Two-Ingredient Gluten-Free Flour Mix for the gluten-full flour. Initially I added xanthan gum, but it’s really not needed in the recipe. And today I make this recipe using half gluten-free flour mix and half almond flour. Using almond flour adds some nutritional value in the flour category, which is always good, of course. This is a recipe that I used to make all the time when I was working outside my home. My co-workers loved it when I showed up with banana muffins. 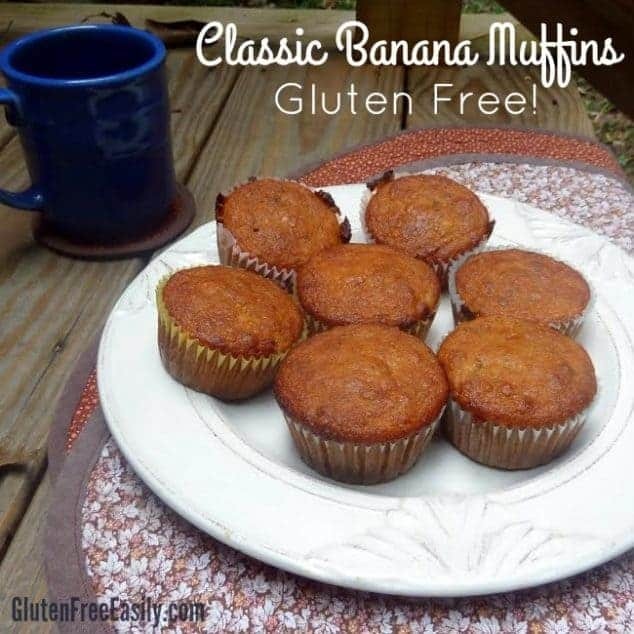 Having “brown” bananas that I could turn into delicious banana muffins was always a plus as I loved putting them to good use by sharing these treats. One time at work we were having a big breakfast celebration with lots of additional “outside” folks in attendance. So I doubled this recipe when I made it. I didn’t do any sampling at home, because I wanted to have plenty of muffins for everyone. However, when I took a bite of my muffin at work, all I could taste was baking powder. Others did not complain, but I was so disappointed—and fairly embarrassed to tell you the truth. Because of that experience, I simply avoided doubling this recipe after that. It was only recently that I thought about that failure long ago and did some research via my friend Google. It seems that there are “old wives’ tales” about how much baking soda and baking powder you should use when doubling and tripling a recipe. Specifically, they say that you should not double or triple those ingredients although you’ve doubled or tripled the other ingredients. There are actual formulas—even from legit baking sites—for how to increase the amounts of baking soda and baking powder per the increase in flour. Admittedly, the formulas vary and some, in fact, completely dismiss this adjustment concept and it’s not one that I have typically used in other recipes that I have doubled and tripled, but when doubling (or tripling) this recipe, that concept needs to be followed. Double the amount of baking powder is way too much; the results will not be pleasing if you do that. I’ve added the information on the amount of baking powder needed when doubling or tripling this recipe to the Notes section of the recipe below. Got brown bananas? Bake some Classic Banana Muffins. I usually make mine with walnuts (or pecans), but if you don’t eat nuts, chocolate chips are always a good substitute! Everyone needs a banana muffin recipe in their baking repertoire! This classic gluten-free version doesn't disappoint. Use muffin/cupcake liners or lightly grease muffin tin. Mix in nuts (or chocolate chips). Bake until golden brown, almost 20 minutes. Let muffins cool in the pan about 5 minutes and then remove them from pan. If not using liners, use a knife to loosen them if necessary. You can use all gluten-free flour mix versus a mixture of gluten-free flour mix and almond flour if you like, but the taste and the appearance of these muffins will be different, of course. Still good, but different. Fill muffin cups only 3/4 full when using all gluten-free flour because the muffins will rise a bit higher than those made with the gluten-free flour/almond flour mix. If doubling or tripling the recipe, do not double the amount of baking powder! Use 1 tablespoon plus 1 ½ teaspoons of baking powder for a double batch. If tripling the recipe, use 2 tablespoons of baking powder. If you double or triple the amount of baking powder for double and triple batches, respectively, baking powder will be all that you will taste when you eat your muffins. Coconut sugar should work in place of light brown sugar, but I haven’t personally tried it. Originally published October 12, 2016; updated November 11, 2017. I need to try this one for the DF,GF folks. I had no idea about doubling the baking powder, soda. WOW!! It sounds crazy not too double everything. HA!! Charlotte–I know, right? I can’t speak to all recipes, but this factor is worth considering and might explain when I’ve seen “do not double” noted for other recipes. I never double my recipes for just that fear about the baking powder- I’ve never been quite sure about how to double it! Prior to becoming Gluten Free, I used to do a lot of baking too. I’ve gotten out of the habit, not so much because I don’t have good ways to alter my recipes, , but because I like them too much and eat too many of them. Your muffins look easy and delicious- bananas with walnuts are one of my favorites. I read about the need to bake and giggled… simply because I SO get it, Shirley! I think you and I are soul sisters in that regard! I get a little cranky and depressed when I don’t have time to bake!